The data from ABI Research, via The Wall Street Journal, shows that Apple's smartphone market share dropped from 18.1 percent in the third quarter of 2009 to 16.6 percent in the fourth quarter. This despite the fact that Apple sold 8.7 million iPhones in the fourth quarter —an 18 percent increase from the previous quarter, and Apple's best quarter ever in terms of total sales. However, as noted by similar research from Strategy Analytics, Apple also saw a year-over-year increase in market share, growing from 10.8 percent in the fourth quarter of 2008 to an estimated 16.4 percent at the end of 2009 —just 0.2 percent off from the ABI Research findings. ABI's Michael Morgan told the Journal that the iPhone could be suffering a case of "Razr burn," referring to Motorola's popular cell phone which dominated the sales charts for years but lost favor when its design went unchanged. But the report quickly discredited that notion. "That of course is a little rich," the report said of Morgan's commentary. "The California device maker still enjoys profit margins among the industrys highest. And the attention it commands is unrivaled (see the frenzy around the iPad unveiling last week)." The overall smartphone market grew 26 percent in the fourth quarter, according to ABI, thanks to increased sales of Google's Android mobile operating system and Nokia increasing sales by 4.6 million. The quarter also saw the high-profile introduction of the Motorola Droid smartphone. "2009 may have started with a whimper but by (the fourth quarter of) 2009 the global mobile handset market ended with a pretty reasonable bang," said Jake Saunders, vice president for forecasting at ABI Research. "We estimate 336.5 million handsets were shipped in 4Q-2009, up 15.1 percent (quarter over quarter)." Nokia remains the overall mobile phone dominant market leader with 37.7 percent, though its share of the smartphone market has dropped significantly in recent years. Nokia and Apple are currently engaged in a number of lawsuits filed in court and with the International Trade Commission over allegations of patent infringement on both parties behalves. In second place was Samsung, which captured 20.5 percent of the global phone market in the fourth quarter of 2009. 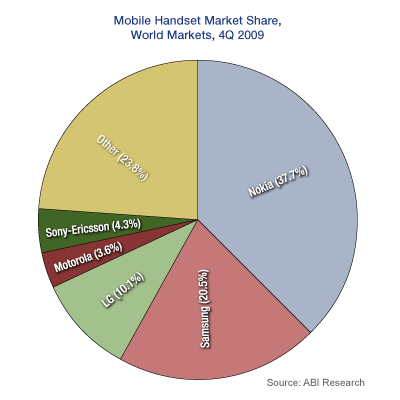 LG took 10.1 percent; Sony-Ericsson was in fourth with 4.3 percent; and Motorola took 3.6 percent. Despite its significant slice of the much-smaller smartphone market, Apple did not register in the top five of total mobile phone sales.